OK, so this isn’t the topic advertised in last week’s blog (Asteroid 2012 DA14 Narrowly Misses Earth), but I promise I’ll post that one next Monday. The unexpected meteor strike in Russia last Friday morning prompted so many questions from readers that I decided to bump two posts already in the queue and address this topic. It had nothing to do with asteroid 2012 DA14, which came from a totally different direction. The meteor exploded about 25 km (15 miles) above the Earth’s surface. Some small fragments reached the ground, and a search for those fragments is underway. Its explosion released an energy of 500 kilotons of TNT (30 times that of the Hiroshima nuclear weapon). The meteor was about 15 meters (55 ft) in diameter, and moving at a speed of 71,000 km/hr (44,000 mph). The meteor had a mass of about 10,000 metric tons. Close to 1000 people were injured, primarily by flying glass from blown out windows. Officials estimate the total damage to be around $33 million (mostly from blown out windows). The graphic above is a composite of several images. 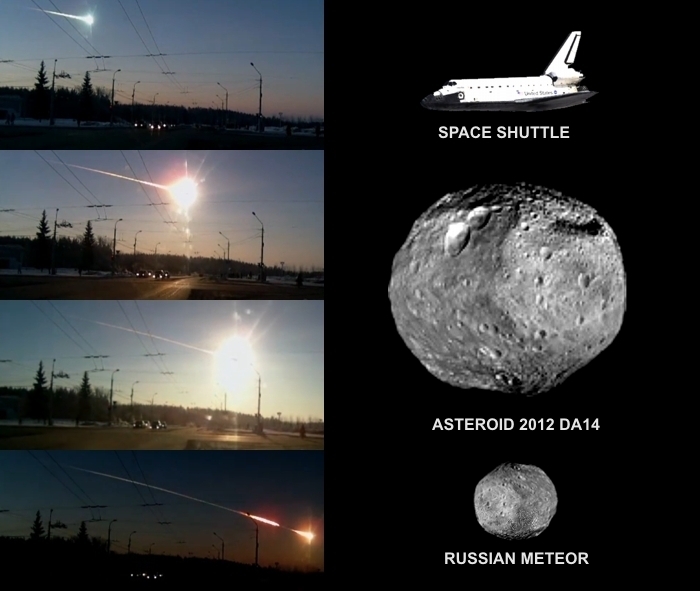 On the left is a sequence of images showing the meteor’s motion through the sky. You can get an idea of how fast this thing was moving by noting the position of the vehicle headlights in each image. The time spanned by those four images is approximately 5 seconds. If you want to see the actual videos, check here (but be prepared for a plethora of annoying ads). On the right is a comparison of sizes to help put things into scale. I should note that, lacking actual images, I’m using an image of asteroid Vesta as a stand-in. The Space Shuttle has a length of 40 meters (122 ft), asteroid 2012 DA14 has a diameter of 50 meters (165 ft), and the meteor that exploded over Russia had an estimated diameter of 17 meters (55 ft). Despite its diminutive size, this meteor had a mass of 10 million kg (22 million pounds). Assuming a spherical shape, we can calculate the density (ρ) of the object as: ρ = m/V = m/(4πr3/3) = 3.89 g/cm3 (where the density of water = 1 g/cm3). The density of a solid nickel-iron meteor is about 7-8 g/cm3. What this tells us is that, although the meteor must have contained some metal, a large part of it must have been rock and ice. And that’s a good thing. 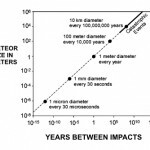 Those “softer” components allow a meteor to disintegrate under the force of reentry through our atmosphere, making it less likely the entire object will reach the ground. The explosion is visible in the third frame above. You can see how the fireball lit up the surrounding area as bright as day. The shock wave from this explosion is what broke all those windows. Some 4000 buildings suffered damage, according to initial reports. Astronomers estimate that an event like this occurs, on average, about once every hundred years. In fact, the infamous Tunguska Event occurred over Siberia in 1908. Unlike asteroid 2012 DA14, objects as “small” as the meteor that hit last Friday are almost impossible to find and track with current technology. Click on the thumbnail below to see an interesting chart developed by astronomers. 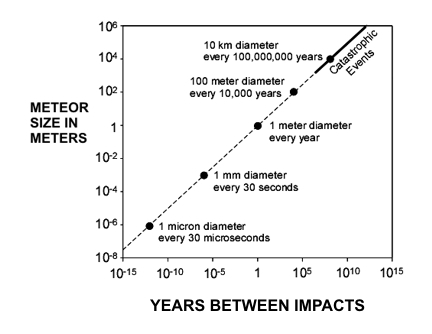 It relates meteor size to the odds of an impact. So are we good for 100 years now, before we could expect another such event? Of course not. This is statistics. The chart above is empirically derived — not theoretical. The fact that this meteor arrived at almost the same time as 2012 DA14 reminds us, in the cautionary words of Apollo astronaut Rusty Schweikart, that “… Earth is in a cosmic shooting gallery.” An impact like the one in Russia could happen again tomorrow. That’s the reality anyway. But I don’t want to panic anyone. As you’ll read next week, astronomers are tracking the really big ones (≈1000 meters) that could cause a global catastrophe. And scientists have already devised several methods to deflect such incoming threats. Your photo illustration of Chelyabinsk is too small. At 15 meters it should be ~1/3 the diameter of DA14. Also if volume (hence mass) scales with the cube of the radius the mass of DA14 should be 270,000 Imperial tons if Chelyabinsk is 10,000 Imperial tons (per NASA) – if the densities of the 2 are similiar? Duly noted, and as you can see, graphic edited. Starting with the Space Shuttle for a frame of reference, I scaled up correctly for DA14, but erred on Chelyabinsk. At 15 meters diameter, the meteor should be about the same height as the Shuttle (belly to top of vertical stabilizer). So my original portrayal was 1/4 the correct size now shown. Thank you for catching that. My calculation of the meteor’s density is, of course, just an average. What fraction was metal, rock, and ice are unknown. I have no idea how Chelyabinsk would compare to DA14 in terms of composition. If there’s any spectroscopic data from these events, it could provide some clues. I have read that NASA’s current best estimate of DA14’s mass is around 130,000 metric tons (130 million kg), so that would seem to indicate a different internal composition.